Sometimes, getting outside to find some hang time just isn’t an option. The sun doesn’t always cooperate or your place might not have a backyard with some suitable trees. 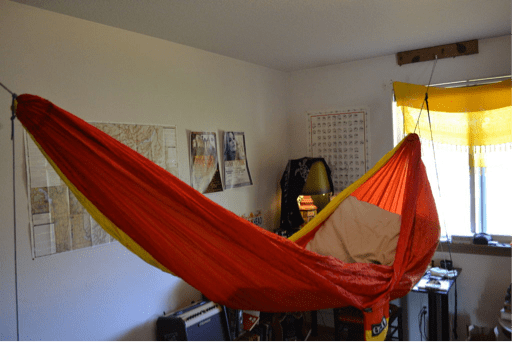 But just because you can’t get a good hang outside, doesn’t mean that you can’t bring your camping hammock indoors. 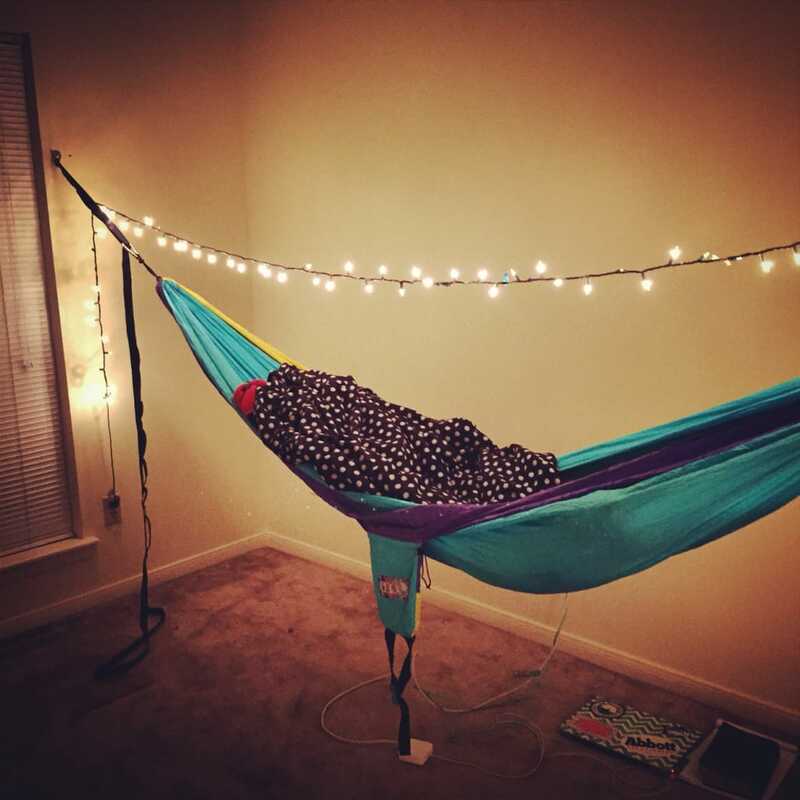 Not only are hammocks great for your adventures, but they also make excellent furniture inside your home.Indoor hammocks offer many of the same perks as hammocking outdoors, but with the added comforts of home. Having a hammock indoors gives you a comfortable way to watch TV, use your laptop or play video games while you’re de-stressing. Some people suffering from back problems have taken to using a hammock as a full time replacement for a mattress. The pack-ability of a hammock is also great for people with limited space for full sized furniture. The major difference is learning how to hang your hammock inside the house. 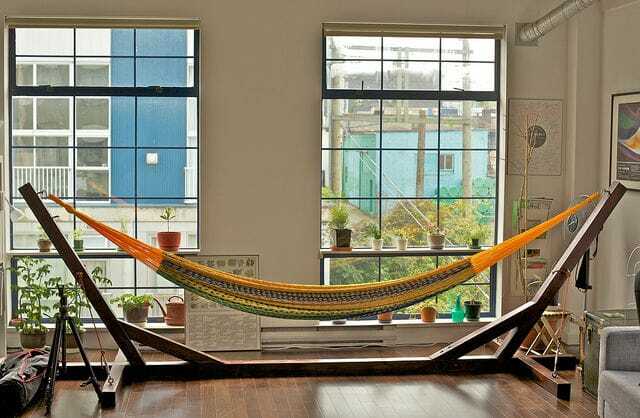 Since most of us don’t have a pair of trees growing in the living the room, you’ll have to find other ways to hang up your hammock indoors. Luckily there are a few different ways to safely get a good hang from the walls of your home. This method of indoor hanging is the most simple. Find the studs on opposing walls and attach a lag hook or eye bolt across from each other. Then simply clip in or tie your hammock to the hook. Use the stud finder to locate the studs on two opposing walls. For the strongest studs, use the ones at the corners. The corner stud is actually three studs nailed together making a stronger support beam. Before you drill into the stud, determine how high you are going to attach the anchor points. You can get a friend to help you hold up the hammock with you so you can make estimate how high the drill needs to be in order to ensure the right amount of slack and height. 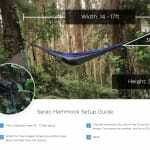 You can use the hammock hang calculator to determine the perfect height for your needs. 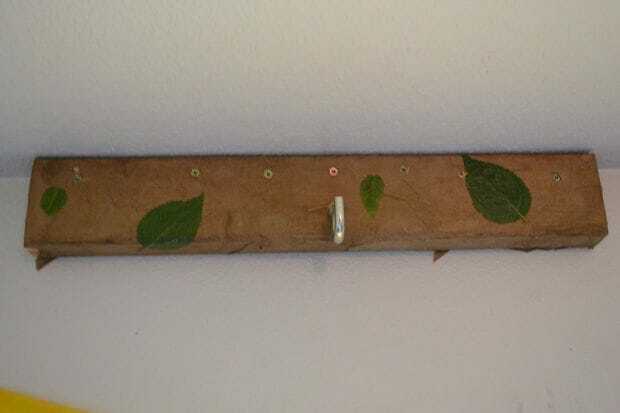 Once you know how high to put the hooks, drill into the stud. Then screw in the hooks into the wall. Make sure it’s actually going into the stud and not the hollow portion of the wall. Use your pliers to give yourself more leverage as the hooks go deeper into the wall. After both hooks have been attached, you can easily use the anchor points to set up your hammock whenever you please! This method sets the anchor points on the top plate of the wall. For those unfamiliar, the top plate is the wooden beam goes horizontally across the wall right where the ceiling meets the wall. While you can also simply drill a hook into the top plate, I like making a mount out of two pieces of 2×4. 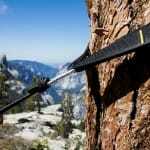 Similar to the first method, drill your piece of lumber and screw in the lag hook or eye bolt. Attach the mount to the top plate by placing it flush against the wall and ceiling. Drill in the drywall screws along the upper portion of the mount so that it will screw into the top plate. Since this mount will be high up on your wall, use paracord on both sides to adjust the slack and height of your hammock. If you are adverse about drilling into the wall or unsure how secure your studs are, you can always get a hammock stand. Stands are available in wood, metal or other materials (I’ve seen stands made from PVC pipes). You can purchase a hammock stand that suits your needs, but if you are more of a DIY-er, you can build your own without too much difficulty. 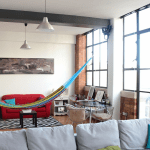 Having a hammock stand takes up more space, and is more of a permanent fixture in your home. However, it will let you hang safely without worrying about potentially compromising the strength of your wall studs. This entry was posted in How to, Setup and tagged hammock set up, hammock suspension, how to, Indoors, instructional.